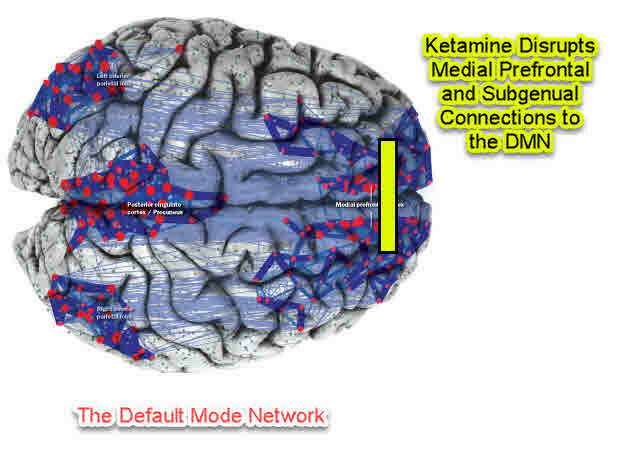 Previously we wrote about how changes in the Default Mode Network may help to explain how TMS works, in this article we’ll talk about the relationship between ketamine and the Default Mode Network. The Default Mode Network is the dynamic set of brain systems that are active when we are not engaged in a specific task. 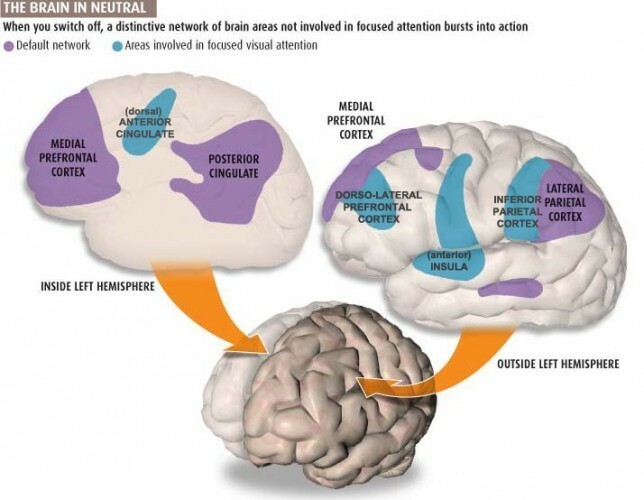 The picture to the right illustrates the reciprocal relationship between areas of the brain activated by one specific task (focused visual attention). When you are engaged in that task the DMN is turned off, by contrast, once you stop focusing on the task the DMN immediately activates. This excerpt from Wikipedia’s excellent article on the subject will give you a rough idea of the role’s played by the DMN. 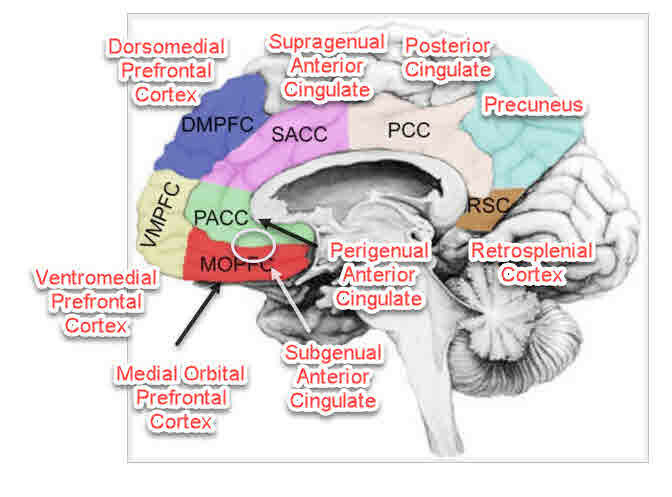 “The default mode network is known to be involved in many seemingly different functions. Since the DMN is involved in a number of tasks that can become preoccupations, or ruminations, in people with depression (thinking about the past and future, social evaluations, theories of the self, etcetera), researchers have been interested in the relationship between the DMN and depression. However, although they have looked, researchers have not found any consistent differences in the overall activity of the DMN in depression. What appears to be the case is that the change that happens with depression doesn’t have to do with overall activity, but rather with the relationship between the DMN and parts of the brain involved in emotional thinking (particularly the medial prefrontal cortex and the subgenual anterior cingulate cortex). In depression, the DMN is hijacked by these parts of the brain, with the result that resting thought becomes entirely consumed with negative ruminations. 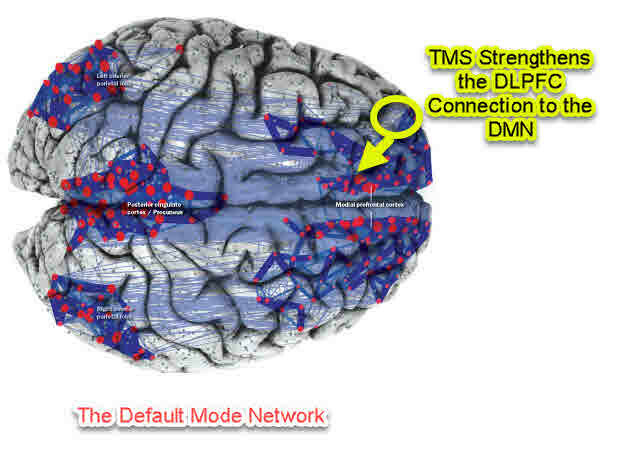 TMS strengthens the connection between the dorsolateral prefrontal cortex (DLPFC) and the DMN. The DLPFC seems to be more involved in thoughtful consideration of a problem, rather than emotional thinking, and strengthening the DLPFC – DMN connection allows the resumption of more thoughtful and reflective activity. Instead of thinking only about negative outcomes that are possible, the brain begins to consider all possible outcomes. Ketamine disrupts the frontal control of the DMN and disconnects the medial prefrontal cortex and the subgenual cortex from the DMN for a period of time, allowing other parts of the brain to take over resting thought. This disruption of the frontal control is why ketamine is associated with dissociation and hallucinations… these are the equivalent of “release phenomena” that occur in various brain networks when one node is disconnected from the network. No longer able to follow the well worn path of negative rumination, the brain comes up with alternative resting state activities. Hamilton JP, Farmer M, Fogelman P, Gotlib IH. Depressive Rumination, the Default-Mode Network, and the Dark Matter of Clinical Neuroscience. Biol Psychiatry. 2015 Aug 15;78(4):224-30. doi: 10.1016/j.biopsych.2015.02.020. Epub 2015 Feb 24. Review. PubMed PMID: 25861700; PubMed Central PMCID: PMC4524294. Bonhomme V, Vanhaudenhuyse A, Demertzi A, Bruno MA, Jaquet O, Bahri MA, Plenevaux A, Boly M, Boveroux P, Soddu A, Brichant JF, Maquet P, Laureys S. Resting-state Network-specific Breakdown of Functional Connectivity during Ketamine Alteration of Consciousness in Volunteers. Anesthesiology. 2016 Nov;125(5):873-888. PubMed PMID: 27496657. Scheidegger M, Walter M, Lehmann M, Metzger C, Grimm S, Boeker H, Boesiger P, Henning A, Seifritz E. Ketamine decreases resting state functional network connectivity in healthy subjects: implications for antidepressant drug action. PLoS One. 2012;7(9):e44799. doi: 10.1371/journal.pone.0044799. Epub 2012 Sep 24. PubMed PMID: 23049758; PubMed Central PMCID: PMC3461985.